This giveaway is now closed! Winners are being notified. Where I work, everyone gets a gift certificate for a fancy ham at the end of the year. It's just a nice little bonus that makes a holiday meal a little easier. For my readers, here's a little end of the year bonus giveaway - but it's not a ham - this bonus is paid in gum! You guessed it, it's Trident Layers! Thanks to a kind PR representative, I've got 4 sealed boxes, each filled with 12 packs of Trident Layers Cool Mint + Melon Fresco gum to give away to 4 lucky readers! It was definitely one of my favorite gum flavors of 2010. Entering the contest is simple: just comment on this post about the best candy you had this year. Also, be sure you leave an email address for me to contact you if you're not a Blogger/Google member. I apologize, I know Blogger's comment system isn't the best for this. If you would rather not leave an email address publicly, you can send it to me at ebidebby@gmail.com and let me know which comment goes with it. 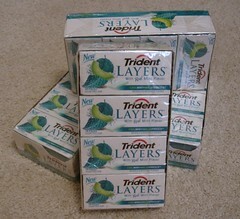 From the comments, 4 winners will be selected at random to each receive a sealed box of 12 packs of Trident Layers Gum! The contest is open to all readers (as allowed by your state or country’s laws). The deadline for entries is 9:00 PM EST on Wednesday, January 12, 2011, at which point the winners will be randomly selected and notified. I will make periodic reminder posts up to the deadline, and post again when all winners have responded. The best candy I have had this year would have to be the Hokkaido cheese tirol, that was my absolute favourite this year. :) I'll email you my email adress. I guess my favorite snack this year was in form of a gum. This would be less know to western world but I think its an awesome piece of gum. Its called : Watering Kiss Mint - Frozen Apple Mint. Great tasting gum not too minty not to apply just right and refreshing too. The best candy this year? It was blackcurrant jelly with yogurt in milk chocolate. Love blackcurrant! The best candy I had this year was a Cadbury bar when I was on my honeymoon in NZ! Back here in Boston, Cadbury isn't AS common. a friend of mine from Japan gave me KitKat Green Tea and it was the best candy i ever tasted in my life. i already stock up for the next year. Hmmm....I think the best candy I've had this year are the little gummy squares of awesome known as Botan Rice Candy. They're the perfect size, the texture is gummy and chewy, and the flavor is a nice sweet citrus. I want some now! I think the best candy I've had this past year is the Chuao Panko bar, with the Pure Dark Island Bark coming in a close second. The best candy I had this year was actually my go-to: Hershey's Caramel Kisses. I didn't branch out much this year, but I plan on trying new things in 2011! 2010 wasn't a very exciting candy year for me, but I did absolutely love Divine's chocolate gingerbread bar. Sooo yummy! the best is the new mini reeces. They are great for snacking and for baking since you don't need to peel wrappers! Incredible! This blog looks just like my old one! It’s on a completely different topic but it has pretty much the same page layout and design. Wonderful choice of colors! ". I bought some of these at PIJ! So cute! I’m going to buy more. I think there is still other merchandise. I have a great product here.